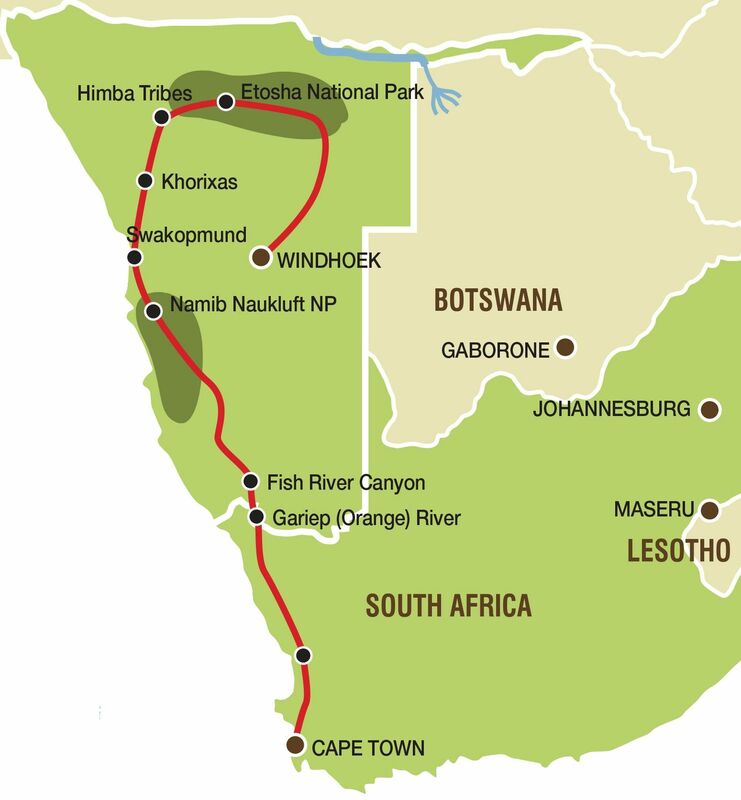 The 13 day South Africa and Namibia Lodge Safari forms part of the 20 day Cape Town to Vic Falls Lodge tour. This tour was designed for those who prefer a bit more comfort when traveling around Africa. On this overland group tour from Cape Town to Windhoek we include some of the not to be missed highlights of Namibia. You could go kayaking on the Orange river and relax in the hot water springs of Ai-Ais. In the Namib desert you can climb Dune 45 and stroll around Sossusvlei. We visit the adventure capital of Namibia – Swakopmund and the spectacular mountains at Spitzkoppe. We go on Safari in Etosha National Park before the tour ends Windhoek, Namibia. We start our South Africa and Namibia Lodge safari as we make our first stop at Table View for some photos of Table Mountain from across Table Bay. The Cederberg region not only boasts spectacular mountains and orange farms, but it is also the home of the Rooibos bush and today we will visit a working Rooibos tea farm and see the plants of Rooibos and Buchu that occur naturally in the wild. Indigenous to the mountain slopes of the Cederberg, this herbal beverage has earned an international reputation as a healthy and refreshing alternative to regular tea. A dinner at our overnight stop offers an opportunity for us to get acquainted while enjoying some South African hospitality. We rise early this morning and make our way to the rim of the Fish River Canyon. We arrive in time to catch the morning rays filter through the canyon. After stretching our legs with a gentle walk along the canyon rim , we turn west and head for Keetmanshoop. Our afternoon will be spent meandering through the Quiver Tree Forest and The Giants Playground. It is named for the way in which the massive dolerite boulders have been placed on each other - creating rock formations and a series of mazes. Every overland tour has some long travelling days and today is one of those as we venture deeper into the Namib Desert. Our destination is the dune fields that cover the western reaches of the desert. Long dusty roads and sparsely populated farmlands offer us an insight into the vastness of rural Namibia. From the grasslands in the east to the red dunes of the west, the slowly changing landscapes represents the many faces of this desert country. Tonight we overnight on the doorstep of the dune fields and fall asleep to the unique calls of the elusive Barking Gecko (small lizzard). Watching the sunrise over the red dunes is an iconic highlight of any trip to Namibia and this morning we rise before the sun to capture this magnificent moment. A brisk climb up Dune 45 offers us the perfect vantage point to marvel at the changing colours of the desert sunrise. Once satisfied, we descend this famous dune and enjoy a hearty breakfast before catching a 4x4 transfer into Sossusvlei. Here we will spend time on foot visiting the pans at Sossusvlei and Deadvlei. Tonight we empty the red sand from our shoes and spend the night under the magnificent desert stars. Our final day in the Namib desert continues as we join a local expert for an educational desert excursion. We leave the Namib behind and after a stop to mark our crossing of the Tropic of Capricorn, we travel to the Atlantic coastline. Today we travel west and make our way to the coastal town of Swakopmund, where adventure and a dose of civilization await. We make a brief stop at the Walvis Bay lagoon, where we hope to catch a glimpse of the Flamingo’s that feed in the shallows. Arriving in Swakopmund we will have the opportunity to book some of the many adventure activities on offer. The Brandberg (Burning Mountains) are regarded as the highest mountains in Namibia and home to the famous White Lady, one of more than 45,000 rock paintings in the area. This morning we will make the 1-hour hike to visit the painting that is said to be around 2,000 years old. After exploring the area, we continue our tour to the area of Kamanjab. Another early rise this morning before we drive to the Etosha National Park. Etosha is the venue for some of the most unique safari experiences in Africa. This afternoon we reach the park and begin with our first game drive (looking for wild animals) as we make our way to the rest camp. It is an early rise as we head off to Windhoek, the capital city of Namibia. Upon arrival in Windhoek, we will take a short walk through the city centre and have the opportunity to view some its better known landmarks. Your tour comes to an end upon arrival in Windhoek (after the short walk through the city).